I tried to download an app onto my smartphone only to be told there was insufficient capacity. This had never happened to me before. In truth, I had never considered the possibility of hitting the buffers and having to delete apps to create space. The following day, I attended a conference on ‘Coming Technologies’. Normally, I expect to arrive, register and receive an info pack of conference details – but this was different. This time, I was instructed to download the conference app. What’s more, the only way to ask questions of any speaker was via the app. Now I applaud progressive thinking and, in theory, I can see the appeal of this app. But when I am forced to remove stored software just to connect with an event, it does raise some big and pretty fundamental questions. Is this ‘progress’ really improving the quality of my life? And even more to the point, do I really need so many apps? To find the answer, I decided to take a closer look at the apps on my phone. And that’s when I discovered a surprising truth – most of them are only sparingly used. Email, Text, Settings, WhatsApp, Maps/SatNav, Dropbox, Facebook, LinkedIn and People (contacts) are my main apps of choice. Indeed, I can narrow that range down to two essentials – WhatsApp and Email – that are my ‘must have’ social and professional communication tools. This left a further 40 – 50 scarcely-used apps that clutter my phone and create major capacity headaches. And believe me, these capacity problems just won’t go away. This morning, in order to update my most frequently used apps, I had to create more space with a second, savage purge! We all know how useful it is to message friends on a one-to-one basis. 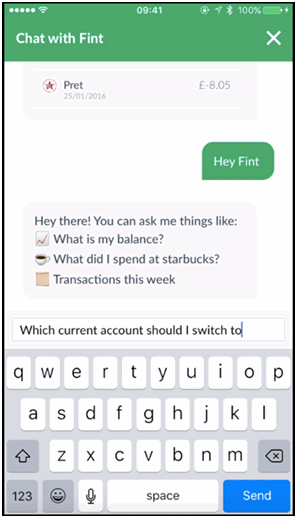 But just imagine you could also use WhatsApp – or a similar channel – as a single, secure, super-intelligent link to your bank, your insurance provider, your mortgage company, your travel agents or any other institution. Instead of dedicated apps to each of them, you have just one channel of choice. Now that is a major improvement… and that’s precisely where bots and AI come into play. We represent two fascinating AI firms. The first is an AI consultancy that has a really deep understanding and experience of most AI platforms, including Watson. The second is an AI product company that has developed a tool which captures the knowledge of human beings and uses it for cognitive reasoning. Both firms have created demonstrators to show how messaging apps can now be used to answer totally unpredictable questions. The first bot is called ‘Matilda’. 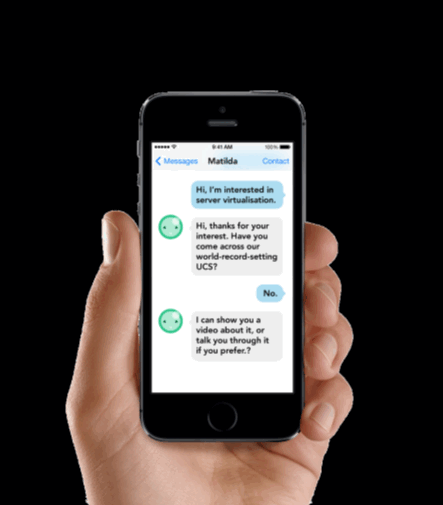 Unlike standard FAQs that can only answer simple, pre-defined questions, Matilda is intuitive and capable of rational dialogue. This screen grab features the start of a complex interaction where truly clever technology interprets customer needs and creates a virtualized, very individual response. This particular demo was produced by our Clustre member firm and is powered by a combination of Watson and AI technology. Having first-hand experience of using ‘Flint’, I can testify to its extraordinary performance. Each time I asked a question, Flint would respond in a very human way… asking questions to clarify my main concerns and remove any ambiguity before answering them in a really informed and informal way. It was uncanny – even though I knew all about the technology powering this service, I became convinced this was a genuine human-to-human exchange. Spooky! 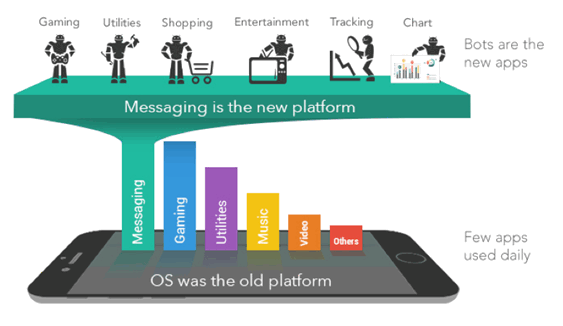 So is Messaging the new platform? The diagram below seems to think so. In every major area of daily activity, it suggests that messaging – Amazon Echo, Siri, Cortana, WhatsApp/Facebook Messenger or perhaps something from Google – will dominate. Although it does stop short of prophesying which one will be pre-eminent. 1Humans are creatures of habit. We prefer the familiar to the unknown. Given the chance to use our favourite comms channel – WhatsApp, Twitter, Facebook, you name it – we will intuitively grab it. And that is why – after much resistance – banks now allow customers to communicate via email. Today’s most successful companies have learnt to communicate with people on their terms and in their comfort zones. 2Apps enrich our lives. In a very real – and real time – way apps add value. 4The people who own the messaging platforms are starting to make moves that are making people decidedly nervous. WhatsApp is now sharing data with Facebook, its parent company. Remember, Facebook paid $19bn for WhatsApp when its market value was ‘only’ $1.9 bn. Similarly, Microsoft paid $26bn for LinkedIn – another massive overvaluation. These weren’t generous aberrations, they were calculated moves to buy customers and personal data. And that frightens many people. There’s an uneasy feeling that data sharing is the thin edge of a deep wedge that will split the privacy and security debate wide open. Who is going to win this battle of the global giants? Well, that’s anyone’s guess – but it’s certain to be a battle of the Goliaths as they fight to dominate the contact channels of the future. The only certainty is that my current headaches should disappear. As more and more companies adopt messaging platforms, my smartphone memory problems should be eliminated. And, believe me, that is one big relief!